Feb. 14, 2013 2:00 p.m. In the mid 1750’s Anthony Henday returned to York with tales about his journeys to the west. He had volunteered to explore the lands to the west in hope of improving his image. Henday had been a fisherman, net-maker, and a general laborer. What the Hudson Bay didn’t know when they hired him was he had been outlawed as a smuggler and had come west to escape a trial. By the end of his travels Henday had penetrated deeper into the west than any other explorer and contributed much of Hudson Bay’s knowledge of the lands it claimed and the First Nations peoples who inhabited them. It would be this knowledge that would drift back to the east and encourage others to follow his trail. By the middle of the 1800’s a number of churches had established missions among First Nations cultures. The first missionaries to come were Oblates of Mary Immaculate soon followed by efforts by Anglican and Methodists missionaries. By the 1890’s the churches began to address the influx of homesteaders from the USA and Europe. Father Leduc would be instrumental in the establishing the first church for Leduc when St Benedict’s opened its doors in 1896. The church would serve Leduc residents until the 1920’s when the need for a bigger church was recognized and St Benedict’s would be replaced, in 1930, by St Michael’s built near the church’s original site. Eventually St. Benedict’s would be dismantled with much of the material being used in the construction of the Peace Lutheran Church in 1936. Father Leduc’s efforts drew the interests of other churches and their missionaries. Alexander McDonald would hold Baptist services in the log cabin of Mr. and Mrs. Hiram Hamilton, before seeing the construction of the Leduc Baptist Church in 1903. To fund the building of the church Rev. McDonald mortgaged his own home. In 1907 to recognize his efforts the Baptists of Edmonton build the McDonald Memorial Church. In 1943 the church changed its name from Second to Temple. Unfortunately the original Leduc Temple Baptist Church was destroyed by fire in June 1950, a few months before the Leduc Hotel explosion. The church was rebuilt and dedicated in the spring of 1951. In 1980 the church moved to its current location in Southfork. 1898 saw the establishment of one of the first “United” Churches when the Methodist and the Presbyterian congregations working under the guidance of Rev. Dr. David G. McQueen built a church in Clearwater and St David’s in Leduc. It would take the Methodist and Presbyterian Churches until 1911 to officially join to become the United Church, but the members living in Leduc had already realized that they had far more in common and the benefits of combining forces to built a church. In 1906 a big imposing man of over six feet stepped off the train with his wife to begin a six-year mission as the minister of St David’s. Rev. T. Thompson Reikie would not allow the mud of the spring or the deep snow of winter to prevent him from making his rounds to Clearwater, Ellerslie, and places in between as well as Leduc. By the time Rev. Reikie left in 1912 he was already recognized as one of the first “United” ministers long before the formal uniting of the churches in 1911. In 1900 the St Peter’s Evangelical Lutheran Church began services in Nisku. That same year a falling tree injured a Mr. John Borys while he was clearing a site for the first Russian-Greek Orthodox Church, St Mary’s, shortly after Rev. Pavlo Tymkiewicz had consecrated the land. Rev. Henry Allan Gray would work in the Conjuring Creek with the English families that had come from Kansas to establish homesteads and over the years other Anglican ministers followed him. Eventually he oversaw the opening of the St. Paul’s Anglican Church in Leduc. Rev. Gray would become Edmonton’s first Anglican Bishop. 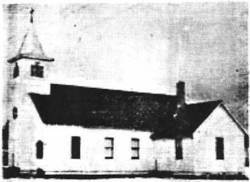 By 1904 the St Paul Anglican Church had joined the growing number of churches serving the residents of Leduc and area. Today Leduc has over a dozen churches and with the rapid growth in population with people coming from all over the world there is little doubt that even more religious groups will develop their places of worship. They may start, like our forefathers did in the homes of settlers, but eventually, as their numbers grow they will find the opportunity to build a permanent place to worship and join the community of Leduc’s churches.